Known as the capital of the Jerte valley or the “Pearl of the Valley”, the city perfectly combines history, culture and its natural surroundings. Before Plasencia was founded in 1186, the area had already been settled by Romans and Moors owing to its strategic importance. The nearby presence of Moorish territory and the city's separation from León by the Silver Way meant a tough beginning for the city. 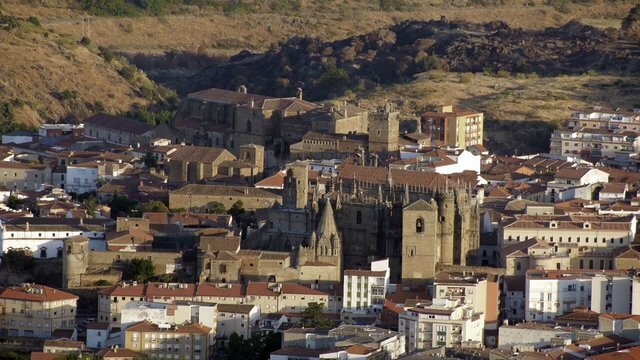 The subsequent Charter of Plasencia facilitated a peaceful co-existence between the Moors, Christians and Jews and led to the creation of an important Jewish community, which brought great economic prosperity to the city. Other events in Spanish history further enhanced the importance of the capital of the Jerte valley, such as the wedding of Juana la Beltraneja and Alfonso V of Portugal and the fact that Ferdinand of Aragon chose to set up residence in the city. Modern Plasencia is home to one of the four University of Extremadura campuses. Surrounded by a wall since its foundation by Alfonso VIII of Castile, Plasencia city centre has been declared to be a Cultural Heritage Site; which is not surprising given the wealth of its religious buildings and others of a civil nature such as its palaces and aqueduct, not to mention its beautiful parks. If you add to this spots of natural beauty along the banks of the river, or the Santa Bárbara mountain range, you'll readily understand why this city is the perfect destination for visitors of all types all year round. A good idea to get to know its streets is to start out from Plaza Mayor, the venue for the Martes Mayor fiesta on the first Tuesday in August every year, which has been declared to be a Fiesta of Tourist Interest in Extremadura, as has its Easter Week festivities. Nearby you have the Old Cathedral with its Romanesque entrance, which then gives onto the Gothic style of the main building. The flamboyant Gothic or Plateresque style of the later, New Cathedral is perfectly attested to by its extremely beautiful façade, while inside you have the crowning glory of its 17th-century main altarpiece and a choir brought from the Old Cathedral, among other treasures. The square where the cathedral stands is also home to the Casa del Deán, a 17th-century building noteworthy for its balcony of Corinthian columns. Close by you can visit the Las Claras Convent or the oldest palace in the city, the 13th-century Casa Palacio de los Monroy. You also have the Episcopal Palace and the Ethnographic Museum nearby. The Romanesque Church of San Nicolás and the Renaissance style Palacio de los Marqueses de Mirabel should not be missed. Continuing on in the same direction you have the San Vicente Ferrer Convent, which has been converted into the luxury, state-run hotel, the Parador Nacional de Plasencia, gates such as the Puerta de la Berrozana, one of the most important along with the Puerta del Sol, the Puerta de Coria and Lucía Tower (with a Interpretation centre). Plasencia is also famous for its important and varied natural heritage, which you can make the most of as you please: bicycle rides, canoeing, trekking and even swimming, at least during the summer months. Of all the parks (Los Pinos, La Coronación, Los Caídos, La Isla, El Cachón and San Antón) that are dotted around this city famous for its greenery, Los Pinos is particularly remarkable for its beauty, its extensive botanic garden, which is home to an outdoor sculpture museum, and as a habitat for different species of bird. If it's a bit of peace and quiet you're after, there's nothing better than a relaxing stroll along the banks of the Jerte at sundown. However, if you're into something more energetic, why not go trekking along the over 90 trails that have been recovered along which you can explore the protected landscape of the Monte Valcorchero and its thirty springs, the Santa Bárbara mountains or even venture as far as the village of El Torno. Más información: Plasencia tourist office.